This evocative shot was taken at the 2011 Heart of the Pennines event, and shows the splendid Willowbrook-bodied Tiger rebuild of 1957 arriving at The Piece Hall in Halifax. Not only did it look great, it sounded great too. Barton’s wonderful fleet had many of these rebuilds. And luckily Les, we have the sound of one of them right here on this site. Time for another listen on the ‘Old Bus Sounds’ page! Yes, the Barton rebuilds, the Willowbrook batch were modern-looking with clean lines, but then, see how the rear wheels were set well in, betraying their 7`6 heritage. Looking around inside, they were obviously an economy product – very basic lightweight construction and lots of brown paint, but surely that was their specification and in that respect they delivered. I first encountered this one parked outside Loughborough Central station years ago, and was amazed to realise it had survived, a Barton rebuild!! Never thought I would see one again. Later, I encountered it again, and I attach one of my pics, here at the LVVS open day in November 2010, where it was a regular performer on trips into Lincoln City Centre but here parked among representatives of many past decades. Needless to say, I contrived to be aboard for some of these journeys, and the sound effects revived old memories. On the straight sections, it managed to trigger off the 30mph warning signs. Was the need for the extra short top deck bay structural as it spoils an otherwise well balanced design? I recall about 1964 one of these was hired for an evening educational visit from Long Eaton Grammar School to Breedon on the Hill, out beyond Castle Donington on the old A453. It was a novel experience, as the arched 13ft 9in headroom railway bridge at Sawley Junction (now Long Eaton) station precluded the use of double deckers on the service buses (3, 3C, 10 and 11) that went in that direction. [Most of you will know that the experimental lowbridge layout Dennis Loline 861HAL was a bid to overcome this obstacle, but as even 861 had to take the centre of the road to clear the bridge, its use in service was not permitted – otherwise, who knows, there might have been a fleet of them.] Anyway, back to the Tiger rebuild, our trip left Long Eaton by Derby Road to Breaston, where it turned sharp left over the Old Sawley level crossing, to reach the A453 after a detour of 2 or 3 miles. Phil, I tend to agree with you about the extra short bay spoiling the balance of the design. These vehicles were built to PS1 length and no doubt Willowbrook used their standard length window bays and needed to stick in an extra bit to make up the greater length. The following batch however were bodied by Northern Counties to a nice four bay design and looked much neater. I liked them both though and I had some memorable journeys on them in the early 1970’s on the X42 Derby – Nottingham express via the A52 by-pass! I was looking through Eddie Collings collection of photos for something and came across the above shot. 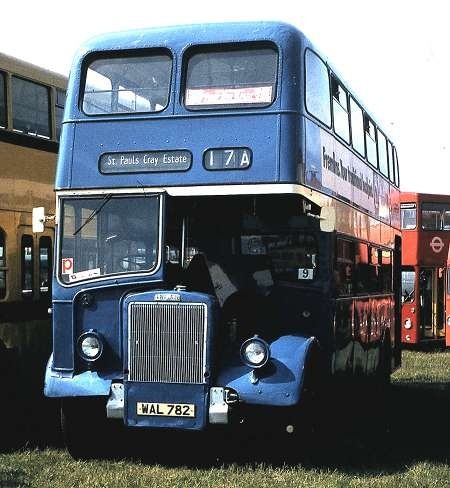 It is WAL 782 not in Barton livery, it is in preservation and looking at other shots it is at a rally, more than likely down south with the Hastings trolleybus behind it. Was it in service with another operator between Barton and preservation this may explain the different livery. A (very) belated reply to Peter’s query on intermediate owners of WAL 782. 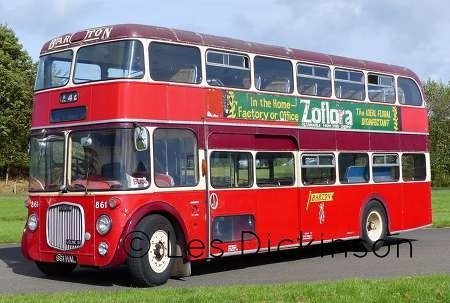 According to the PSVC fleet history, 782 was sold to Ensign in 1974; then to Williams, Llangollen, Hollis Queensferry and Cross Roads Travel, Warrington in fairly quick time, before passing to preservationists in Kent in 1978, moving within preservation by 1996 in the Medway area. In recent years it was owned by Quantock MS; I believe it is currently owned by the Barton family, as part of their collection. It looks as if it could have been in poppy red and white. Heaven forbid! I’ve been going through the "Past Comments" and found this entry which I seem to have missed previously. I note comments about her history. Above is a view of her with Durrant, Sidcup, whilst in the Southsea Spectacular on 8 June 1980. Relax, folks, not poppy red as Chris feared! I believe she was actually new to Bolton Corporation, before her time with Barton. 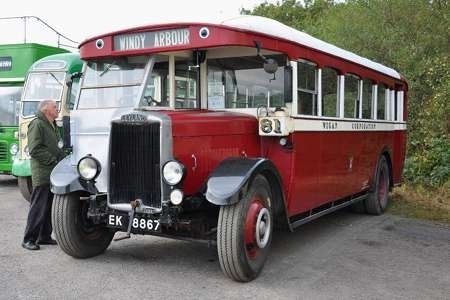 The only information I have managed to unearth on the net says that the chassis of WAL 782 was new in 1948 to Knowles & Son of Bolton, registered CWH 262, carrying a Santus C33F coach body. One of the sources is the Classic Bus Website, which is reasonably trustworthy. The chassis is given as PS1/1 – does PS1/B (top of this page) indicate a Barton rebuild? If so, whose designation is it? 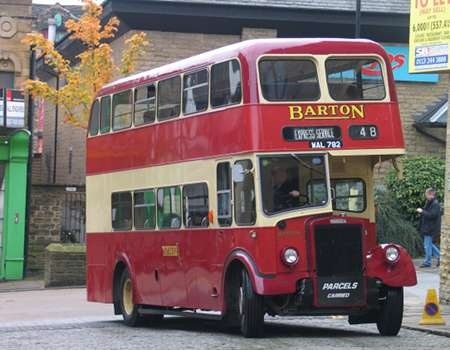 I haven’t come across any suggestion that Barton used the vehicle in its coach form, but someone with a Barton fleet history should be able to say one way or the other. The Circle fleet history of Barton confirms David’s information above – new in 1/48 as CWH 262 to Knowles of Bolton, with a Santus C33F body; to Enterprise Motors (Blackpool) Ltd in 5/53; then to Goulding and Smyth, Hooton, Cheshire and to Millburn Motors, Preston (dealer), who sold it to Barton. 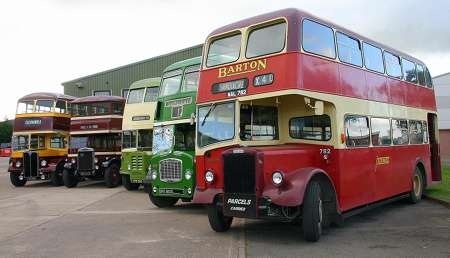 I doubt if it ran for Barton as acquired – more likely it was simply a source of a chassis for rebodying. 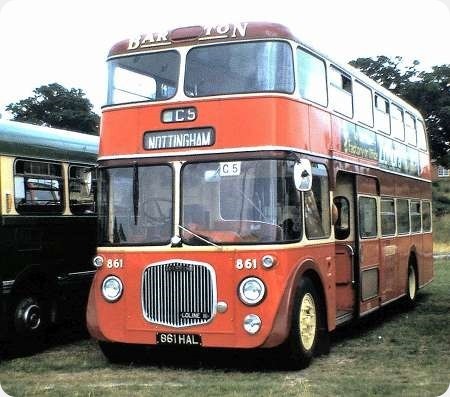 According to Alan Oxley’s book on Barton, relaxation of the double deck length to 30 feet allowed PS1 chassis from 27’6” to be rebuilt as double deckers and comply with regulations. He also states 782 and others, were standard Leyland PS1 products, which Barton coded for their own reference as PS1/B. 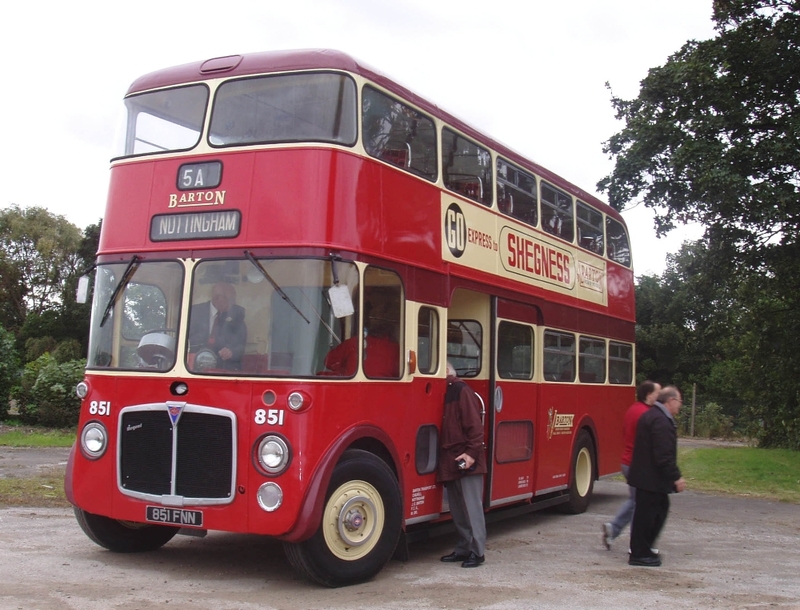 The Circle fleet history records the chassis number as the original Leyland number with a B prefix. What do we know about Santus? I’ve never heard of them. Santus was a Wigan-based coach builder based in Wigan, along with Northern Counties and Massey. At one time there was a preserved Wigan Corporation Leyland Tiger (TS4?) with a Santus body. There was an article in Classic Bus magazine a few years ago about the firm. Apparently there is no connection between the Santus body builder and another firm of the same name also in Wigan which made toffees! Unfortunately I cannot now recall the fate of the Santus body-building company, only that they built saloons and coaches in pre-war days, and possibly early post-war. Can’t access the magazine article at present – Sorry. There is a bit more about Santus on this site- a Bedford OB, it is thought (!) on the Isles of Scilly. Chris, our very well informed fellow contributor to this site, Neville Mercer, has given some information about Santus under the OBP entry for Vics Tours (Isles of Scilly) – Bedford OB. Well, once again my knowledge of something somewhat obscure has been satisfied by some knowledgeable folk. Thank you all. Remarkable that Wigan had at least three bus bodybuilders. Did Wigan Corporation show local loyalty by buying examples from all three companies? Yes Chris, Wigan did support all three Wigan coach builders in pre-war days. I’ve checked my Leyland Society book on the Leylands of Wigan Corporation. This shows Leyland TD1′s purchased and bodied by Leyland itself, plus the three Wigan builders in 1931. Santus also figures as the builder of single-deckers on TS4 and TS7 chassis, like the one shown earlier, now preserved. I think it owes it’s survival to being used as a library for several years. However after 1936, the Corporation used only NCME and Massey, and Leyland itself for its contracts. One batch was bodied by English Electric in 1939. Post-war, the body builder spread continued to be Leyland, NCME and Massey, but not Santus. The book I referred to doesn’t mention any reason for the Corporation excluding Santus from the order book in the later 1930′s. Apparently those supplied were to and “old fashioned” appearance, but this seems to have been a Wigan requirement, and also applied to those buses supplied by the other manufacturers. This still applied to the 1937 TD4s, whose bodied closely followed the 1929 Leyland TD1 design (piano front, etc)! Chris, Wigan Corporation did indeed show loyalty to local manufacturers, as I believe that from 1929 onwards (apart possibly from wartime allocations) it sourced chassis solely from Leyland, and bodywork from either Northern Counties or Massey Brothers, although I’m not sure how many Santus-bodied buses it operated. However, it was no doubt prudent of the Corporation to help the local economy in this way, as many of the bodybuilders’ employees were likely to use the Corporation’s buses to get to and from work etc, thus helping swell the council’s coffers. Certainly not post-war Chris H because Santus didn’t build double deckers. You really should have a look at their coaches though because they were quite unlike any others, I’ve always had a fascination for them and it’s a pity that there are no survivors but build quality put paid to that. They did body just about every chassis going though even if few of them had long lives, I suppose this Barton PS1 was typical, lasting less than ten years with it’s coach body. It was actually revealed after the article in Classic Bus that the coach building and the confectionery business were in fact related so even though there are no remaining coaches, at least you can treat yourself to a bag of Uncle Joe’s Mint Balls! Perhaps the excessive amount of sugar in the mint balls help to speed the decay of the vehicle body. Oh, we’re wandering off topic again! There is an example of postwar Santus coachwork in preservation, an unusual Seddon Mk IV registered DPR 518. It’s not been active for some time and I only discovered recently that it’s owned by someone I know (albeit not too well). I understand work is progressing on it very well. 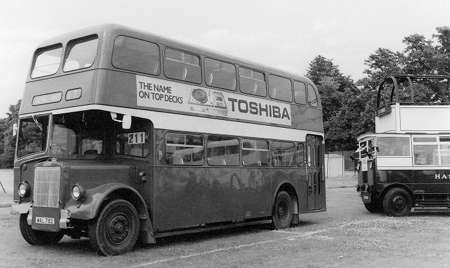 With 74 PD1s and 42 PD2s with Leyland bodies and the first postwar Northern Counties and Massey double-deckers not delivered until 1956/7 I wouldn’t actually describe Wigan as loyal to the coachbuilders of the town. 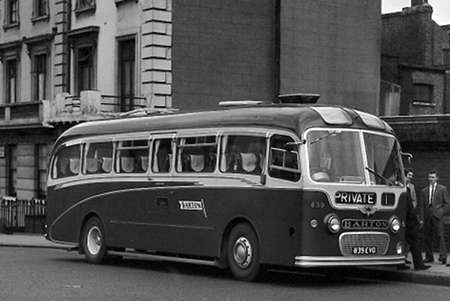 They bought just a handful of single-deckers prior to 1956, all with Northern Counties bodies. They clearly liked the Leyland body. Well David that will ‘learn me’ to read my books more thoroughly, and also to clean my glasses more frequently. When I fished out my book on Northern Counties again, regarding Wigan Corporation it states that from 1930 onwards "bodywork was always built in the County Of Lancashire, and more often than not, supplied by either Northern Counties or Massey Brothers of Wigan". It was the "more often than not" that failed to register I’m afraid. I should have remembered the Leyland-bodied Leyland Titan PDs, which might have prompted me to think more broadly with ‘local’ meaning Lancashire rather than solely Wigan!